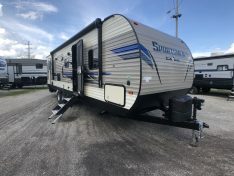 The Sportsmen LE line of travel trailers by KZ RV allow the consumer to enjoy the most desirable amenities found in RV’s today at surprisingly low RV prices. 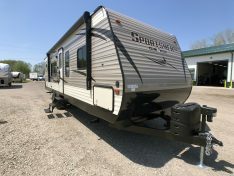 “Surprisingly” because once you enter a KZ Sportsmen LE travel trailer, you will be amazed at all of the well appointed options included at a lower than expected RV price. 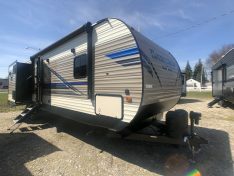 Affordable RV’s for a family of 10 or an affordable camper for 2. 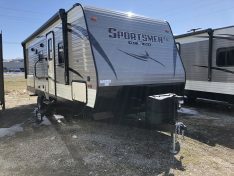 If you are looking for value without sacrificing quality, Sportsmen LE by KZ manufacturing just may have what you are looking for. 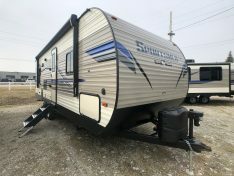 This KZ Sportsmen LE 291RKLE Rear Kitchen travel trailer offers great prep space in the kitchen, a jack and jill bathroom along with two recliner chairs in the living area.